Set in a fairly near future in which fossil fuels are unavailable but electrical power is plentiful–in Seattle anyway–the initial chapters create a dystopia that is actually not such a bad place to live. Pedal power rules the crumbling streets and freeways, while people live where they will and, increasingly, however they wish. Project Corvus has not been tagged yet. 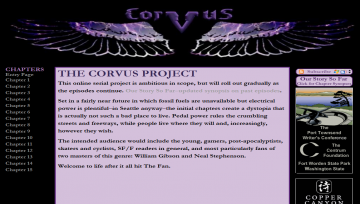 Help others find Project Corvus by tagging it! Project Corvus has not been reviewed yet. Project Corvus has not been recommended yet.